If you've ever had unfiltered vinegar you may have noticed a film develop that can make the vinegar look cloudy. This film is known as mother of vinegar and is the result of bacteria fermentation. Some people discard this substance; however, the "mother" is often regarded as the most nutritious part by many health food advocates. 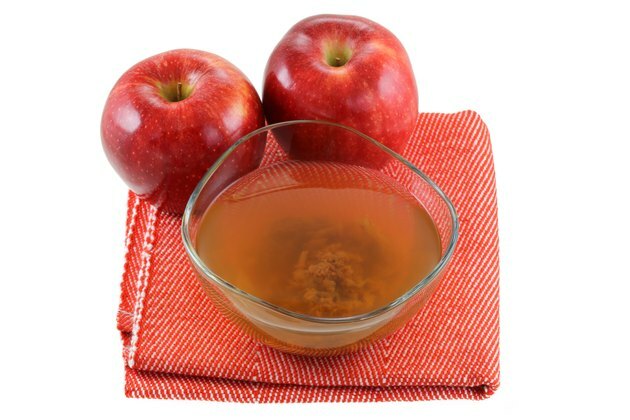 Mother of vinegar can form in any unpasteurized vinegar, but it's commonly associated with apple cider vinegar. A study appearing in the February 2015 edition of the Journal of the American College of Nutrition determined the bio-active components of mother vinegar. Upon evaluation, the authors discovered that mother of vinegar is high in iron. Iron is necessary for the body to create the protein hemoglobin that carries oxygen in the blood. Additionally, iron plays a role in normal growth, development and cellular function. Plants produce a large group of beneficial compounds known as phytochemicals. While these are not essential nutrients, they do play a role in health. Mother of vinegar is a good source of these compounds. The phytochemicals in mother of vinegar falls under the category of phenolic acids and, along with other phytochemical compounds, these substances protect against diseases. One of the major phenols in mother of apple cider vinegar and mother of pomegranate vinegar is gallic acid, a substance also found in tea and grapes. Mother of vinegar is rich in indigestible carbohydrates called prebiotics, according to the book "Apple Cider Vinegar" by Victoria Rose. Prebiotics serve as food for beneficial bacteria that live in the intestines. When you eat prebiotic foods, the good bacteria are able to grow and flourish. Probiotics crowd out harmful bacteria and a balanced population of friendly bacteria keep your digestive system healthy. Prebiotics reduce the risk of allergies and gastrointestinal infections, writes the authors of a review in the August 2010 issue of the British Journal of Nutrition. Rose writes that mother of vinegar is a good source of B vitamins. B complex vitamins work together so that your body can produce energy from the foods you eat. B vitamins also keep your nervous system healthy; a deficiency causes peripheral nerve problems where you feel tingling sensations. Another important role of B vitamins is to help the body produce red blood cells to circulate oxygen and nutrients. Leafy greens, beans, fish, poultry, eggs and dairy products are other sources of B vitamins.